Ride south from the Lussi Trail network on the Jackrabbit Trail to find 3+ miles of machine-built trails that are surely unlike anything else you’ll find within the Blue Line. On the south side of the golf course lies Scott's Cobble, a defunct ski area that was abandoned in the 1970s. BETA established a new flow trail on this property in 2017. 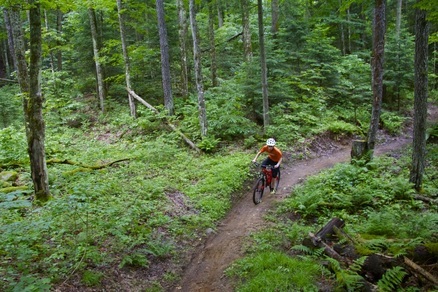 Craig Wood trails are owned by the Town of North Elba and are located adjacent to the Craig Wood Golf Course. The most fun can be had by climbing on the "Back Nine" trail which merges into the "19th Hole" for a crazy fun, flowing downhill. For a short second lap climb back up the "Back Nine" and then hit the big banked turns and jumps on "Poppa Wheelie". The downhill on the Jackrabbit Trail back to River Road will leave your eyes watering. Please stay on marked trails and DO NOT ride on or through the golf course, except to connect from the club house parking lot to Poppa Wheelie. Park at the steel deck bridge on River Rd, near the Jackrabbit Trail access point (or better yet, ride from the Village to this point). Ride south on River Rd (stay on the road and do not enter private driveways), then take a left onto Maynard Rd across from the large red barn. Follow red markers up the dirt road and onto Bird Song Lane, then turn right at the marked, gated entrance for the Jackrabbit Trail. ​ Climb the Jackrabbit Trail and look for a sign for the "Back Nine" trail just before the trail enters the golf course.